It was a beautiful day here in MN....temps in the mid 70's! I spent a lot of the day yesterday outside doing some yard work, cutting back shrubs, bushes and just getting ready for fall. 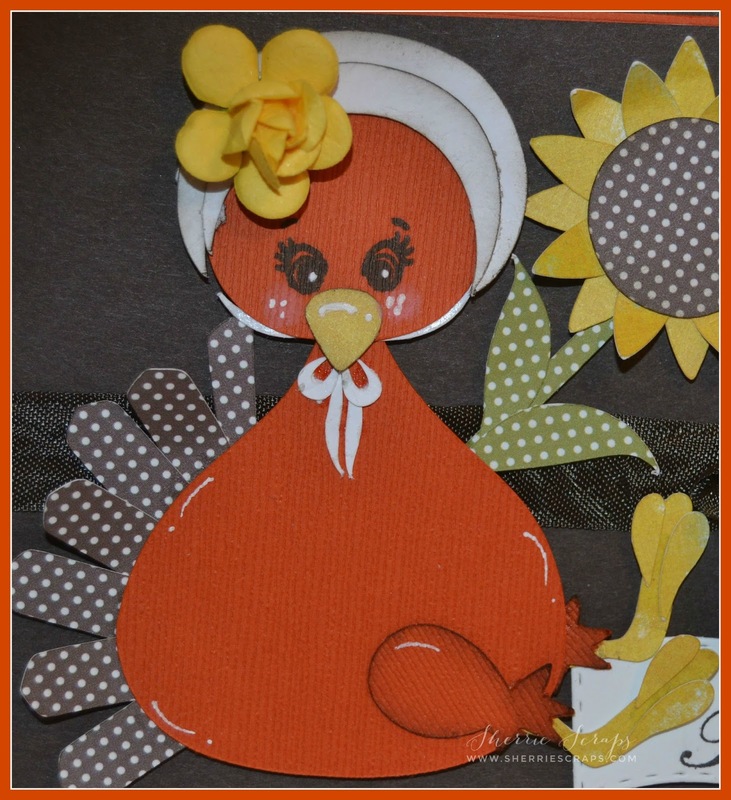 I even had a little time in my craft room to create a card to play in some fun challenges, yay! I have a quick card to share using Kadoodle Bug Designs~Thanksgiving Turkeys file and a stamp set from Scrappy Moms Stamps. 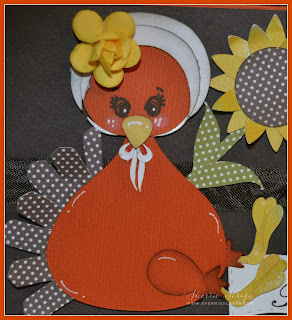 Oh my gosh, this is such a fun file and you get a lot of cute files with this set....great for Thanksgiving projects. To check it out, go HERE. I started with a brown card base and followed with a layer of orange. I cut a smaller panel of brown along with pattern paper before I adhered this darling turkey in place. The face is stamped with PKSC-27 March 2014 stamp set and the flower was from my stash. I tied on some 3 Girl JAM charcoal ribbon and tied a double bow. The banner is JB Mini Tag Dies 2 and the sentiment is stamped with Scrappy Moms Stamps~The Charmed Life. I finished with fun enamel dots from Doodlebug. 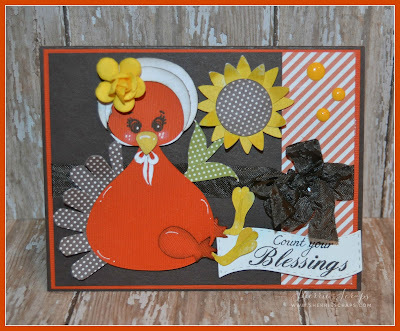 Such a fun card, love that adorable turkey! Very pretty papers and colors you used too! 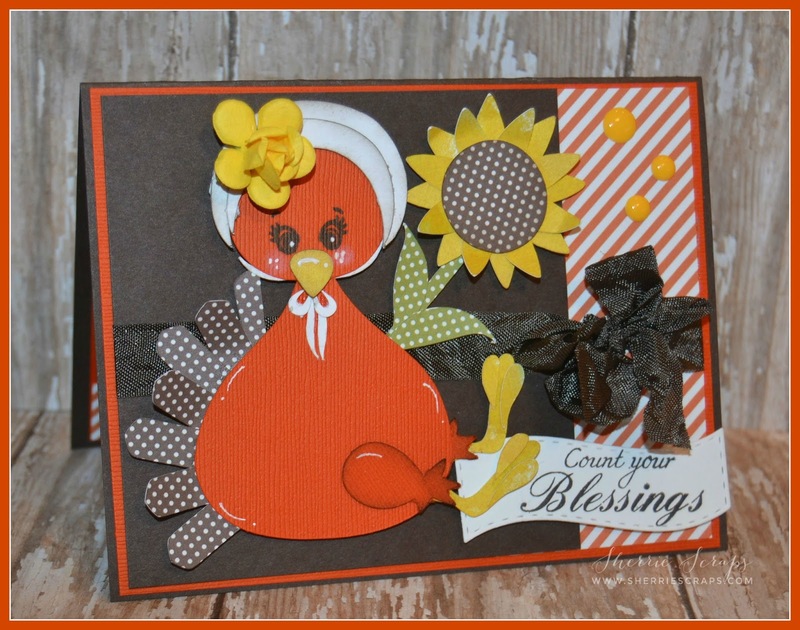 Thanks so much for joining our challenge over at over at Scrappy Moms Stamps! This is so sweet. I love TURKEY and your patterned paper and design are awesome. Oh, Sherrie, this is so sweet!! That is the most adorable turkey!! I love the rosy cheeks and the flower in her hair!! The details you added are just perfect!! What a fun card my friend!! It makes me smile!! Thanks so much for playing along with the DL.ART September Linky!! What a cute card. I love the turkey with her little flower and that adorable face. Great papers and sentiment. Fun and so cute! Love that turkey! Colors and papers look great! So very cute Sherrie! That little turkey is darling! Sherrie this is adorable as ever!!! LOVE this cutie! And love your little details on the turkey! Beautiful card! Sooooo cute! LOVING that turkey!!!!!!!!!!!!!!! How cute is that turkey......really great card Sherrie! OMG how adorable is this card Sherrie!!! LOVE that turkey!!!! Hope you had a GREAT weekend my friend! That sure is one cute little turkey! What a sweet little turkey!! That turkey is so cute ! Goes perfect with your wonderful Fall themed card ! I love how you used the patterned paper ! This turkey is ADORABLE!! LOVE it!! Totally cute card my friend!! A wonderful sentiment as well. What a cute card with the perfect Fall colors! Adorable turkey! Have a super day my friend! It's hard for me to believe it's fall and almost time for Turkey! This sure is adorable, love that chunky butterball and pretty sentiment. I am way behind in yard work though....but let's keep that our secret. Sherrie ~ Well this is just DARLING!! LOVE that little turkey and how you did her up PERFECTLY!! Didn't miss one thing and I adore the flower! Well I am playing catch up again today ~ I hope your vacation was AMAZING btw! A Standing Ovation..just for you! Happiest Wishes on your birthday!